July 19, 2012 – At 11:54 the Schuylkill Haven Fire Department was dispatched to 55 Stanton Street, in the borough for a possible house fire. Chief 735 (Snyder) was the first to arrive on scene and was met with a smoke condition coming from the basement of the residence. Fire personnel arrived on scene and determined that the oil burner had malfunction. All SHFD units were on scene for approximately 20 minutes. July 19, 2013 – at 08:54 Stations 1 &2 were dispatched to 98 Broadway St. “The Island” to set up for incoming Medevac 7. Crews arrived on scene and established a secure area for “the bird to land”. Fire personnel also assisted with patient transport to the helicopter. All units were placed clear and available shortly after take-off. Chief 735 (Snyder) had command. July 7, 2013 – At 23:40 the Schuylkill Haven Fire Department Rapid Intervention Team was dispatched to 423 W. Fairview Street, the city of Pottsville for a working structure fire. Crews arrived on scene and stood-by until being released by command after approximately 2 hours. Squad 739 and E-732 responded with Chief 730 in command. 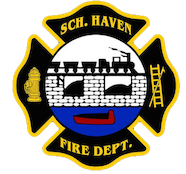 July 6, 2013 – At 16:43 the Schuylkill Haven Fire Department was dispatched to 28 Parkway Avenue, in the borough for a working house fire. As Chief 730 arrived on scene and confirmed a working fire on the second floor of a residence. More info and photos coming soon. July 1, 2013 – The Schuylkill Haven Fire Department responded to numerous medical assists through-out the day. Great job to all SHFD members who assisted with patient care. Chief 730 had command of the incidents. June 30, 2013 – At 17:50 the SHFD was dispatched to 1 Tamaqua Boulevard for an automatic fire alarm. Crews quickly arrived on scene to find nothing showing from the exterior. Chief 735 (Snyder) determined the alarm to be a false activation and placed all units available.